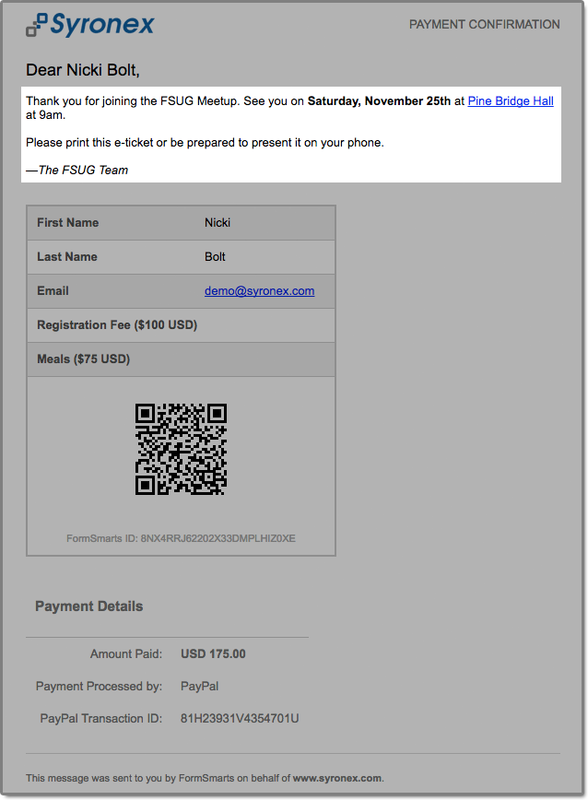 Show a detailed confirmation page where users can choose to receive a confirmation email or download a PDF receipt. Select the redirect option in the Form Details screen of the form builder to automatically redirect users to the Return URL of the form instead of showing them the confirmation page. This feature allows you, for example, to redirect users to a download URL of your site after they’ve entered their information. If you have embedded a form onto your site and set it to redirect to the Return URL, some browsers may load the URL in the iframe that was containing the form. If you want the page to consistently load in the top browser tab/window, follow these instructions. Note: Do not choose this option if your form includes a payment, as users would be redirected instead of being led the page where they are asked to make the payment. 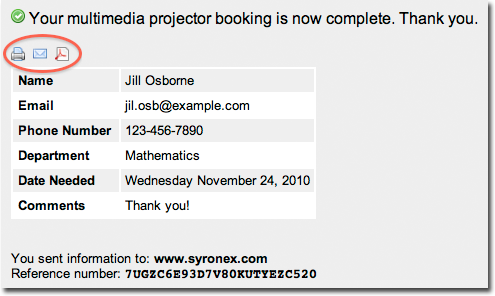 Print a copy of the form data. Feel free to try this demo. Use the detailed confirmation page whenever you want users to be able to keep a copy/proof of the data they’ve submitted. This feature is only included with Business accounts. PDF receipts may not display correctly in non Western-European languages (Russian, Chinese,…) unless the language is set explicitly with the lang parameter. Visit the Forms Tab of the form builder and click the icon showing a pen to edit the corresponding form. Towards the bottom of the Form Details screen (pictured above), change the On Submission action to ‘Show summary with print, email & PDF options’. Posted on Oct 12th, 2010 in form builder.